The Dambari Wildlife Trust's Conservation Across Boundaries (CAB) programme aims to enhance wildlife and natural resource conservation and sustainable utilisation in the Matobo Hills region in Matabeleland South province of Zimbabwe. 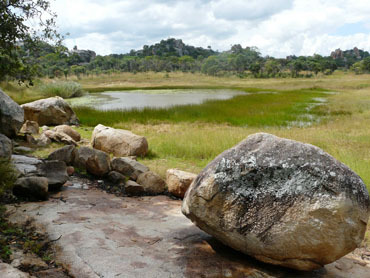 The Hills cover an area of approximately 3000 km², most of which was declared a UNESCO World Heritage Site in 2003, and include a diversity of land use and land tenure types, from protected areas (the Matobo National Park and private wildlife ranches), to commercial ranchland and subsistence farming and communal areas. One in five rural households in the area are food-insecure and increasing pressure on the land for crop production, livestock grazing and natural products (e.g. wildlife, non-timber forest products) poses challenges for long-term sustainability. The CAB concept is based on building biological and social bridges across man-made and natural boundaries, to reduce the impacts of hard edges and habitat fragmentation on wildlife, and to encourage sustainable use of ecosystem goods and services by people. The programme seeks to increase knowledge and awareness among people, in order to cement the desire to conserve natural resources for future beneficiaries. These aims will be met through applied research and collaborative conservation efforts within the Hills; a central tenet of the programme is the participation of stakeholders throughout the process, via consultation and the development of participatory projects. Stakeholders and participants include indigenous communities and their leaders, local government, National Parks staff, commercial ventures (e.g. tourism, crafts), local students and scientists. Thus, a wide range of stakeholders will benefit from novel approaches to resource management and improved communications, as well as through skills development. These will be achieved through a number of integrated projects involving research and monitoring, training and education, development of sustainable livelihoods.